Foreign labour is damaging the UK. Much of UK law is controlled from overseas. Even their domain name is not from the UK: the “.org” in UKIP.org is governed from the USA. Ubuntu is South Africa/Isle of Man – not quite UK…. and NginX is decidedly more Russian than American – Sysoev is single-handedly responsible for a lot of it. The main take-away here is that these are principally open source projects which are developed by teams of individuals from around the globe, not bound by the old ideas of nationality and geography, but by a common goal. UKIP believe that arbitrarily defining people based upon which bit of land they were bought in is somehow conducive to a better world. Why stop there? Why not continue down that path and arbitrarily define people based on the colour of their skin? We’re all human, and we can all do better by putting aside historical differences and pulling together in our brave new world – but I fear this will not happen for as long as the entrenched power base continue to profit and benefit from the status quo. UKIP are a particularly virulent and unpleasant strain of the old guard, and belong in the past. Born on, not bought in. “The main take-away here is that these are principally open source projects which are developed by teams of individuals from around the globe, not bound by the old ideas of nationality and geography, but by a common goal.” – That’s what UKIP are actually trying to promote…free trade globally. We can’t trade with China etc because we’re in the EU. Yet Switzerland and Norway can. “UKIP believe that arbitrarily defining people based upon which bit of land they were bought in is somehow conducive to a better world. Why stop there? Why not continue down that path and arbitrarily define people based on the colour of their skin?” You need to actually read what they are saying – UKIP want selective immigration – i.e. skills based not open door where anyone can come in and take advantage of the best welfare state around. It’s just common sense. Poor post and I think it actually proves the opposite of what you’re trying to suggest. I.e. that UKIP are isolationist, nationalist and because they’re not using UK technology to power a website they’re contradicting their new poster campaign? Except they’re the opposite – UKIP are anti European union (directly related to open door immigration which the poster campaign addtesses) not isolationist, anti Europe or anti working with foreign companies. What powers their website isnt really a good example for this but it actually showcases at a micro level of what UKIP are saying – we live in a global world, let’s work and trade with other companies independently and have our own trade deals. Let’s use what is best for us, not what a bureaucrat in Brussels thinks is best for us (or his own back pocket). Whether its UK based or not is irrelevant. Its a common sense approach to doing business. And maybe just maybe they aren’t using UK technology because its not good enough? And perhaps that’s because of all the Employment legislation and all the other blumpff from Brussels / Strasbourg that applies to companies of all sizes. Might be fantastic if you’re a multi national but not if you’re a UK tech startup bound by reams and reams of EU legislation. If we left and deregulated there’d probably be a ton of succesful Uk tech companies springing up and employing people so you’d no longer have to be sad about a lack of blossoming tech companies in the UK in reference your tweet back to me. I always wonder when I see blog posts like this are they the views of the writer or those of their clients? If said writers are consulting for big companies, who are going to be very much Pro EU so they can keep employing slaves at shop floor / warehouse level then those views rub off quick when they’re directly related to to his or hers own pay cheque. This article is on a par with numerous Daily Mail and other newspaper attempted smears since UKIPs recent surge in popularity. Zero value add. I agree that the implied hypocrisy in Dan’s post isn’t there. 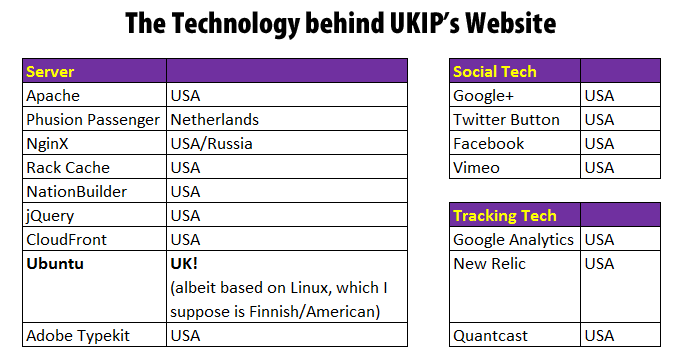 There’s plenty of UKIP hypocrisy, such as the UKIP youth leader, Olly Neville, being sacked after expressing support for gay marriage despite the party’s supposed ‘libertarian’ ideology – but that’s out of the scope of a ‘tech’ blog. What on earth are you on about? I run a UK tech startup, and in eight years of operating in a fiercely regulated sector not once have we come up against the EU, with the exception of the cookie law, which stupidly implemented as it is, is well intended at least. We’ve benefited from the EU in the form of R&D tax credits, and various co-pay schemes for our employees – all funded from the EU. As to the EU being the problem – I respectfully disagree. The EU is a modern political body built in the 20th c. without the encumbrances of historical tort and all the rest. It’s extremely democratic in how its run, and we only tend to view it as undemocratic because we’re actively discouraged from engaging with it politically in the UK. Many other EU member states’ citizens are far more involved – and the system of representatives ensures that no member state has sway beyond their economic and geopolitical means. Either way, in order to unite people, you have to bring them together under a homogenous power bloc with devolved powers which ultimately dovetail unto a unified global system. As to not being able to trade with China??? I have no idea what you’re referring to. We trade heavily with them, to the tune of £40bn last year – http://www.telegraph.co.uk/finance/china-business/10588975/UK-China-trade-hit-record-high-in-2013-says-Chinese-ambassador.html . As to regulation of businesses – it’s sadly necessary – humans cannot be trusted to act well. cf. toxic dumping, care home abuse, etc. As far as I can tell, and I’ve looked pretty heavily into this, UKIP are the party of common sense. But unfortunately common sense isn’t all that common. My posts here make probably look like I’m Farage’s dream come true but I’m actually a non voter currently. That will probably change in May and in 2015 though. I see your view Max but I think you have fallen victim to the usual EU bull. The benefits you speak of just aren’t there, it offers nothing we couldn’t do ourselves. I’m not trying to suggest the EU hasn’t done good things either, when they’re passing so many laws each year some of them are bound to be good 😉 my concern is what we can’t do due to being part of the EU – we live in a global world that’s fast moving, stuck in a political union where you can’t make agile decisions means we are in a very weak position. The EU makes it difficult to innovate, makes it harder for small business owners to take on staff due to stupid employment legislation and is generally anti competitive. This is exactly why the big boys love the EU – they are sitting pretty knowing the barriers to entry are sky high for smaller companies to take market share. I think you need to look into this a bit more, it’s worrying that people see the EU as modern and democratic. I guess Blair did a good job of marketing it. When did you vote for Herman Van Rompuy by the way? The UK government are governed by the EU, they have little say in how we live and you yourself have even less. How many times have we pitched for EU reform but walked away empty handed? That speaks volumes. The EU is a dated model, built on the premise of a free market that’s become far more than that. For one reason or another it has a fear of independent nation states hence why it is swallowing more and more up. To say citizens are far more involved or united is daft – look at Greece, Cyprus, Spain – there’s unrest and they’ve had an EU flag, anthem and currency forced upon them when it simply doesn’t work. There’s more coming too – I have worked with plenty people in EU countries and views are definitely changing – they’ve had enough, they haven’t got what they signed up for or what was sold to them. They agree a Europe that collaborates is a good thing, but not in this sort of system – their own governments are losing the ability to govern themselves, and that means the man on the street is losing his or her own ability to shape his or her future via ballot box. I think this is ridiculous, and is a bit defeatist in nature. Are you saying we are incapable of running our own country or too weak to be a factor in a global economy? You don’t need to unite people under one over arching power to get on with one and other – that’s just stupid. It’s called a working relationship – trade together, get on together, do business together. Why do we need to be in a Union to do that? One depressing thought: is this list an indictment of UK tech’s contribution to the present-day web? I’m not sure that it’s a problem if not, although part of the UK’s comparative advantage is surely in this area.